Groom 2 masquerade mask is from Gypsy Renaissance's Wedding Masks collection. 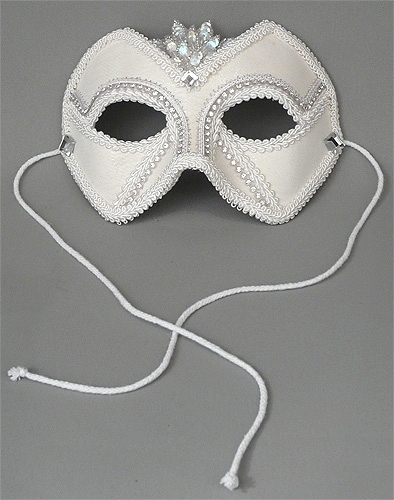 Groom 2 is a white mask with white trim, beaded appliqué, and crystal rhinestones. Also available in black satin or black velvet. Groom 2 mask is covered with iridescent white satin fabric (as shown), black satin, or black velvet, decorated with braiding and crystal rhinestone banding. Mask is finished with iridescent white or black sequin and beaded appliqués and crystal rhinestones.